Left: Open Pit Mining. 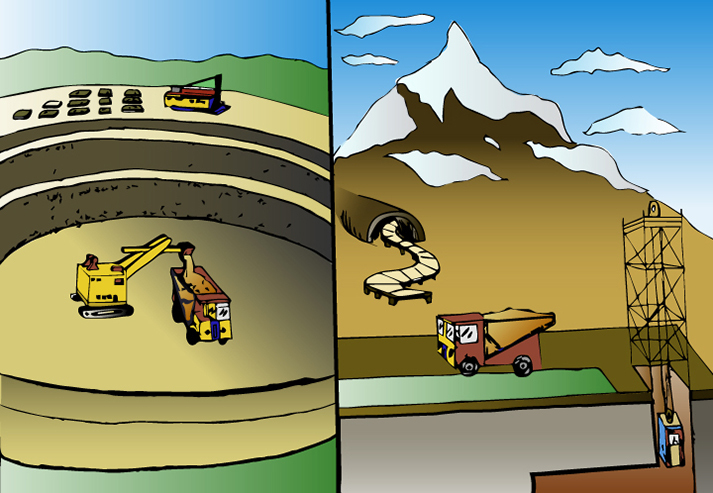 Right: Underground Mining. In each of these mining methods, various earth-moving equipment including shovels, dozers, hauling trucks, and loaders are used to remove and transport the ore. However, the first step is to loosen the rock in the ore body so that it can be moved and processed. Blasting and grinding equipment are used to accomplish this task. In both mining techniques, the mined ore must be removed from the mine and transported to a plant for processing and refining. Trucks and trains are used for this purpose.